Sermons Models for Future Preachers. Spanish rabbi and author; born about 1420; died in Naples 1494. He was at first principal of a rabbinical academy at Zamora (probably his birthplace); then he received a call as rabbi and preacher from the community atTarragona, and later from that of Fraga in Aragon. He officiated finally in Calatayud as rabbi and head of the Talmudical academy. Upon the expulsion of the Jews in 1492, Arama settled in Naples, where he died. Arama is the author of "'Aḳedat YiẓḦaḳ "(Offering of Isaac), a lengthy philosophical commentary on the Pentateuch, homiletic in style. From this work he is frequently spoken of as the "Ba'al 'Aḳedah" (author of the "'Aḳedah"). He also wrote a commentary upon the Five Rolls, and a work called "Ḥazut Ḳashah" (A Burdensome Vision), upon the relation of philosophy to theology; also "Yad Abshalom" (The Hand of Absalom), a commentary on Proverbs, written in memory of his son-in-law, Absalom, who died shortly after his marriage. Arama was the very type of the Spanish-Jewish scholar of the second half of the fifteenth century. First of all he was a Talmudist. The study of the Talmud was of the utmost importance to him; so that he lamented deeply when his rabbinical pupils could not follow him from Zamora to Tarragona, because the latter community was unable to support them. In the next place, he was a philosopher. The study of philosophy was so universal in Spain at that period that no one could assume a public position who had not devoted himself to it. Arama had paid particular attention to Maimonides; but independent philosophical thought is hardly to be found in his work. His remarks concerning the nature of the soul ("'Aḳedah," chap. vi.) are noteworthy. After a detailed account of the various theories about the soul which had prevailed, he comes to the conclusion that the first germ of the soul, common to the whole human race, has its origin with and in the body. His theory is that of Alexander of Aphrodisias—that the soul is the "form" of the organic body—but Arama is able to adduce support for it from Talmud and Cabala. The third element in Arama's mental composition was Cabala as expounded in the Zohar, which he believed to have been written by Simon ben YoḦai. He did not, however, occupy himself so much with the mystical side of Cabala as with its philosophy. His earliest work, the "Ḥazut Ḳashah," presenting in a certain sense an enunciation of Arama's religious philosophy, includes also much that is interesting pertaining to the history of the Jews in Spain prior to their expulsion. The aim of the work was to furnish a rejoinder to the missionary sermons of the Church, to which, under the laws then prevalent, the Jews were compelled to listen. Hence his polemic against the Christian dogma of Grace is the résumé of an oral disputation between Arama and a Christian scholar. In support of his attack upon this Christian dogma, Arama adduces the doctrine of the freedom of the will as formulated by Aristotle, and the consideration of God's transcendent justice, which would make Grace to consist of nothing but the exercise of the will of a despot. Besides this instance of his polemics, his treatment of the Deluge contains several attacks upon Christianity. The greater portion of the work, however, is devoted to the confutation of that philosophy which refuses to recognize Jewish revelation, or recognizes it only as identical with philosophy. For his extensive use of the allegorical mode of interpretation, see Allegorical Interpretation. Arama's chief work, which exercised great influence upon Jewish thought, and is still much read, is the "'Aḳedat YiẓḦaḳ." This is considered by many as the classical work upon Jewish homiletics. The form of the sermons contained therein was closely imitated by the Darshanim. The old sermon was either didactic—among Germans, upon ritual matters; among Spanish and Provençal Jews, upon philosophy—or else it was of an edifying, moralizing nature, such as the Haggadot. Arama's sermons in this work were the first attempt to unite both these tendencies. Though not artistic, he should not be reproached therefor, but should rather be commended for having established a model for generations of darshanim and modern Jewish preachers. 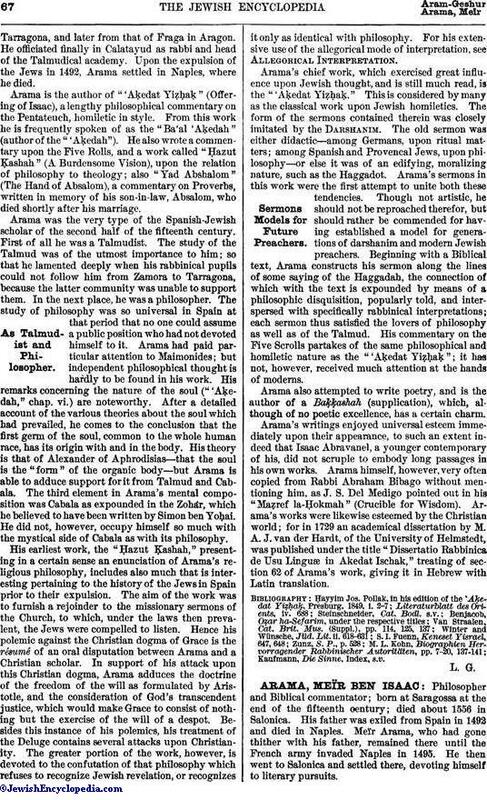 Beginning with a Biblical text, Arama constructs his sermon along the lines of some saying of the Haggadah, the connection of which with the text is expounded by means of a philosophic disquisition, popularly told, and interspersed with specifically rabbinical interpretations; each sermon thus satisfied the lovers of philosophy as well as of the Talmud. His commentary on the Five Scrolls partakes of the same philosophical and homiletic nature as the "'Aḳedat YiẓḦaḳ"; it has not, however, received much attention at the hands of moderns. Arama also attempted to write poetry, and is the author of a Baḳḳashah (supplication), which, although of no poetic excellence, has a certain charm. Arama's writings enjoyed universal esteem immediately upon their appearance, to such an extent indeed that Isaac Abravanel, a younger contemporary of his, did not scruple to embody long passages in his own works. Arama himself, however, very often copied from Rabbi Abraham Bibago without mentioning him, as J. S. Del Medigo pointed out in his "Maẓref la-Ḥokmah" (Crucible for Wisdom). 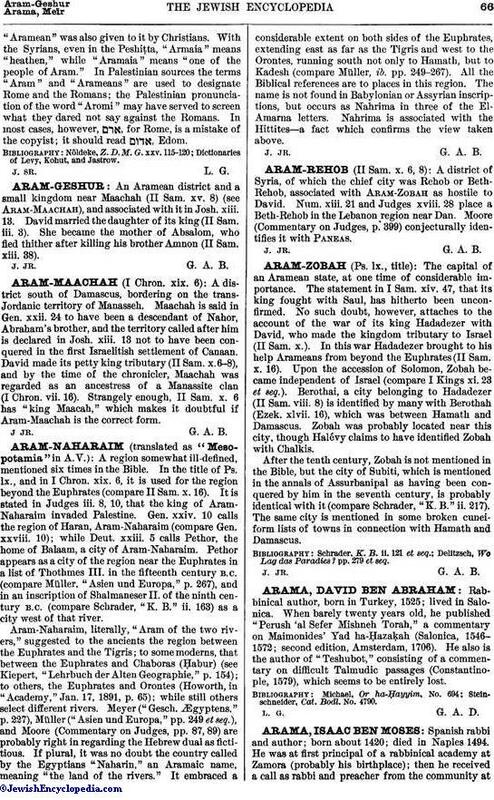 Arama's works were likewise esteemed by the Christian world; for in I729 an academical dissertation by M. A. J. van der Hardt, of the University of Helmstedt, was published under the title "Dissertatio Rabbinica de Usu Linguæ in Akedat Ischak," treating of section 62 of Arama's work, giving it in Hebrew with Latin translation. Kaufmann, Die Sinne, Index, s.v.